Professional transcriptionists have an array of transcription tools which help them work smarter and streamline their daily workflow. 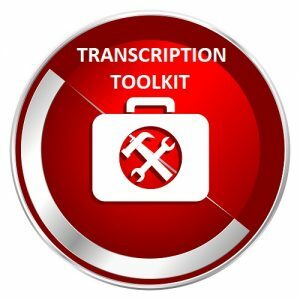 In the professional transcriptionist’s toolkit you will often find any or all of the following: a transcription foot pedal, transcription software, text expanders, a good quality headset, a list of most commonly used hotkeys, and a selection of audio file converter software apps. For those transcriptionists who are not so fleet-fingered on the keyboard, but who love all things technology-related, try any one of the clever text expanders available on the market. Text expander apps work a little bit like predictive typing or auto-complete on your phone – they take short abbreviations that you have previously programmed, and expand them into larger phrases or “snippets” of text, which are activated when typing. Text expanders help you type more with less effort, thereby reducing the pressure to improve typing speed and accuracy. Some of the transcriptionists who contract to Pacific use text expanders such as Breevy, PhraseExpander, and AutoHotkey. Transcription software is an assistive tool used by typists to play and listen to audio and video files, which the typist then converts into a written transcript. Many typists who use transcription software also use a transcription foot pedal, to control the playback of audio. Key features of transcription software include the ability to speed up and slow down audio speed, easy import and play of most common audio and video formats, customisable hotkeys, and compatibility with a transcription foot pedal. Many transcription software apps also have the ability to insert timestamps, which is essential for typists who transcribe for research clients. Some common transcription software apps are NCH Express Scribe Professional, Audiotranskription, Olympus ODMS, Philips SpeechExec Professional, For The Record (FTR), Gearplayer V4, and QuikScribe. Transcription foot pedals, also known as foot switches, are designed to be used with compatible transcription software. When paired with suitable transcription software, foot pedals enable typists to control the audio using the pedals, rather than hotkeys or the mouse. Most foot pedals and transcription software are configurable, so you can determine which pedal performs which function. The use of a foot pedal frees up your hands so you can concentrate exclusively on typing. Keyboard shortcuts or hotkeys are not in the exclusive domain of online transcriptionists. Gamers, web developers, script writers, accountants, almost anyone who uses a keyboard in their daily work also uses hotkeys. Hotkeys can be created with most word processing programmes, and similar to text expanders, allow the typist to customise their keyboard function keys to create one-stroke commands. Many of the most commonly used hotkeys are already set as defaults, such as CTRL-F for Find, CTRL-C for Copy, CTRL-V for Paste. A comprehensive list of hotkeys is easy to find online, as are instructions for configuring your own hotkeys. Not all audio and video formats can be played by all transcription software apps. For example .ds2 files (a proprietary format) are not supported in Express Scribe Professional, one of the most popular transcription software apps used by transcriptionists across the globe. This is where audio and video file converter apps become indispensable to the professional transcriptionist. Audio and video file converter apps (and some transcription software apps) convert the file into a more playable format. Popular converters include Switch, Goldwave and iTunes, and there are many more file converters available online, both free and paid versions. Having access to software which can quickly convert uncommon or problematic audio and video formats to more playable formats is an essential tool in every professional transcriptionist’s toolkit. method of connecting (Bluetooth or tethered). A good quality headset which is comfortable and can be worn for hours on end, puts less stress on your listening skills, and makes your work as a transcriptionist easier. From transcription foot pedals to text expanders, audio converters, headsets and transcription software, there are many tools which professional transcriptionists rely on to help them cleverly deliver superior transcripts to their clients. If you are new to the world of transcription, try one or all of these top transcription tools today!